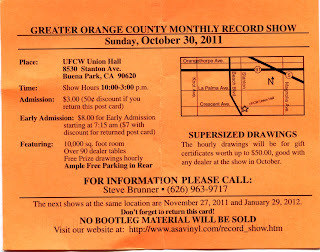 Greater Orange County Record Show - Show hours 10am - 3pm, $3. Early 7am admission $8. I have been going to this show for many, many years. I have hardly ever walked out without buying something. Found some real gems here too. They have been having this monthly show for the past 26 years now and they claim there are 93 tables. There are lots of dealers from all over. All genres are represented here. You can also buy record protection supplies like plastic sleeves from Far West Record supply here. Several local and regional retail shops sell here as well. 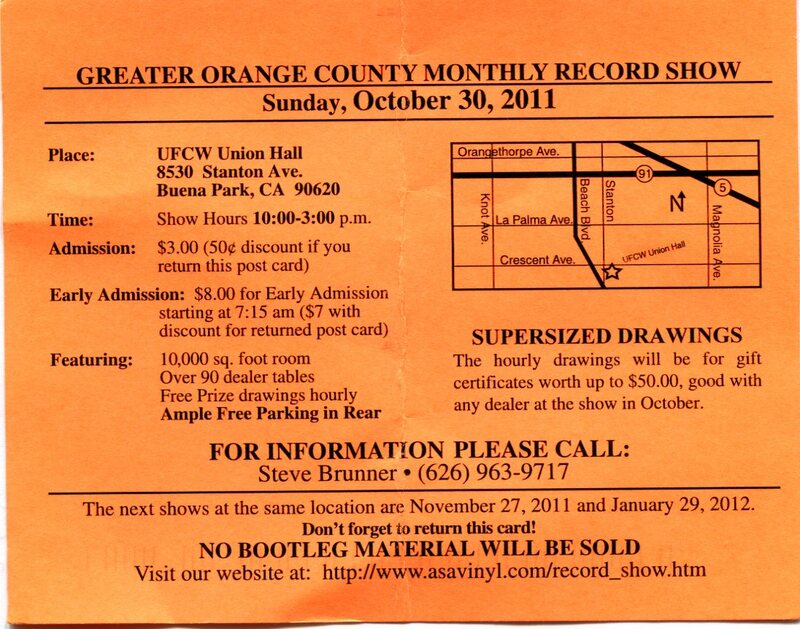 They have hourly raffles where they call out names of people that drop their direct mail postcard in a box at the door, you can win up to $50 that is good for any dealer at the show. I won one time. Remember it well, I spent my winnings on a rare Husker Du LP. This place is cool, you can of course try and bargain with the sellers. It says on their postcard NO BOOTLEG MATERIAL WILL BE SOLD. not totally accurate, there are some boots, you just have to look. There is usually at least one bootlegger here selling CD and DVD product. If you are from out of town and plan to come to this show, here's a tip: If you time it right, you can hit this OC show (which is the last Sunday of the month) and a show at the Pasadena City College the following weekend (first Sunday of the month). The PCC record show is contained within the very large antique flea market which is also fun to check out. There are some of the same dealers at both, but many different ones as well. I’ve been collecting Vinyl for many years. Mildly obsessed. I travel quite a bit and when I travel to a new place, the first thing I do is find all the second hand Vinyl shops, flea markets, etc and I go to as many as possible. I collect bootlegs, imports, promos and rarities, LP's and 7"s. I listen to and collect classic rock, rock, metal and punk...mostly. With this blog I hope to share with you my record buying adventures and experiences.